When I look at her, I can't imagine her being hurt and alone. It makes me so sad. Thank you for all you do. Our sweet Baby Girl, Midge Myrtle, went to be with her brothers Mycroft and Sherlock on April 20, 2017. She was the princess of our house and had the attitude of a diva. She came to DRoH from a local shelter when they said she was on the list to be euthanized the next day. DRoH got her and another dog who soon became our first fosters. It was their pictures on the internet that made me want to foster. From the moment she walked into our house she owned it. She would snap at our older dog's nose leaving him totally confused. She spent many of those first days in doggie timeout. Two weeks into fostering her, she needed back surgery as her back end was totally down. I remember crying and driving frantically from JV to NHVS to get her the surgery she needed. THANK YOU DRoH and your supporters. A few short days later she was released and rehab began. We had no idea what to do, but I remember being so thrilled when she peed for the first time on her own after the surgery. She fought back to regain all of her movement. Time went by after the surgery, but nobody seemed interested in adopting her. I guess it was God's way of telling us to figure it out - she was meant for us. At Christmas of that year we made it official and she became our baby girl. I have a husband and now two teenage boys. It is a rough boy house, but put baby girl near them and they turned to mush. Our boys would sing songs about her and cuddle with her endlessly. She would pee on my husband's bathroom rug and he would just roll his eyes - she had him wrapped around her little paw. On April 20th, we felt it was time to let her go after years of being fine it seemed her back had again let her down and her bladder was no longer functioning. She finished life eating every treat the doctor threw down in front of her and left dreaming of more treats to come. There will never be another Midge and I don't know at times how our hearts will be repaired. Thank you DRoH for saving her and paying for her back and allowing her to be part of her life. I wanted to send a thank you to you all and DROH. My son and I went to meet Charlene this AM at her foster home. I have to admit that when I went to meet Charlene, I was not confident she was the right match for me. I was concerned she looked too much like my sweet Minnie that I lost just less than a month ago. But when we met Charlene, it was easy to see while she may have looked like my sweet Minnie - she had her own very distinct personality. She is a sweet girl and I am confident we will be a family in very short time. She met my son's younger lab who is still very much a puppy - and they got along perfectly. Both ran themselves tired in the yard. We had a trip to Pet Smart and picked up new toys, sweater, food and treats . She easy made herself at home. She ate a very full bowl of food for her dinner and now is resting well. 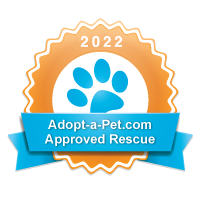 I have been so impressed with all involved with DROH - it is obvious you all are committed to finding perfect forever homes for your sweet doggies. May God Bless you all for the work you are doing. We have decided to name her "Ruby". - she is a precious red gem. "Yesterday/last night went so well. When it was time for bed, Todd got under the covers with me and never left my side. Well, when he first got into bed he checked out how high off of the ground he was, and he thought better of it. Plus, I said, "No, Todd" and he went zoom! right under the covers. Hank (his new brother) gets down on his stomach to relate to Todd on his level, which is adorable. They relate just fine with no altercations. They're actually playing right now. Todd spent the evening going from me to Matt to Connor, showering us with kisses. He is settling in wonderfully. He only had one poopoo accident this morning because it was raining outside. Completely understandable. I don't blame him. We LOVE him. He's a part of the family already. Please mark him as "adopted". " Larry Tate is now known as "Ralphy" as in Ralph Mouth from Happy Days. He is very protective of the bed and me and if anyone approaches he can bark SO LOUD for that little body..he can make you jump straight out of bed. He has come out of his shell and will now come when I call him, and go to his area for "bisquits" when we put the baby gate up in the kitchen for he and his brothers to stay while we are away. When did I know he had chosen us...on Saturday, for the very first time, he ate dinner with his pack, instead of me taking him in the chair away from everyone, and holding the bowl for him. He has started playing with us and his brothers. I was worried about him for a long time, he was showing NO signs of improvement. But its like he has flipped the switch. Ralphy is home now. Congrats DROH for another HAPPY TAIL! Greta has been a wonderful addition to our family. We call her "Baby Greta" or "Miss Greta" and she's earned every bit of those nicknames. She is a slim 17-ish lbs these days, down from the 22 she was when she came home to us and the even bigger size when DROH brought her in. She loves to lay on beds or the couch (always with blankets and a pillow), alert us to noises, hunt squirrels, chew antlers and bully sticks, bask in the sun, help her Dad in the kitchen, and lay on her back. She is dignified and regal, with the perfect amount of sass, and we love her signature "Greta grunt" when she's ready for a nap. Thank you, DROH, for our gorgeous Greta! Hans is an absolute joy, and we are so glad that "Buddy Hans" or "Fuzzy Britches," as we like to call him, is a part of our family. He is a slim 17.5 lbs these days, down from the 23 he was when we he came home to us and the even bigger size he was when DROH brought him in. He loves to lounge on the couch, faithfully guard the house, hunt squirrels, birds, cats, and other wildlife, make friends at the dog park (usually puppies), occasionally play with toys, go anywhere his Momma goes, and lay at the foot of the bed. He hasn't stopped sticking his tongue out since the day he came home, and we love his mischievous attitude. Thank you, DROH, for this delightful dachshund. Winnie has settled in beautifully and is certainly the owner of this apartment. She loves her bones and driving around with her head out the window. She also enjoyed her trip to Boston and New York over Thanksgiving! The very first day I saw the girls that were to be my foster's I think I fell in love with them. They walked into my home and life as if they had always been there. Senior doxie girl June (also known as Princess, Little Little) is dynamite in a small package. This is one tough little girl that continues to amaze me with her strength and courage. Kourtney is a little sweetheart always ready to please and play. One of her favorite past time is chasing the birds that are around "her" bird feeder. Kourtney wants everyone to be happy. I want to think DROH for allowing June and Kourtney to be part of Herbie and my life. (Herbie is my soon to be 16 baby boy doxie). Everyone at the rescue have been so helpful and kind. All of them are a wonderful group of hard working, caring, individual's. Izzy has the funniest personality, and she loves to entertain; It's hard not to fall in love with her immediately. She loves adults, children, other animals, and her toys. The first day I had her, she walked right up to an adult husky, jumped up with her front paws on his shoulder, and she started licking his face. That same day, she eased her way up to a toddler, and rolled over so he could pet her. She is so easy going, and lovable. She loves attention, and she loves to play. My whole family and I are crazy about her! I'm so thankful for the Rescue for finding Izzy for me; I don't think I could have hand picked a better suited dog for myself! Mo stole the hearts of his foster family and never left their home. This sweet handsome gentleman had found his "forever". His last breath was with those he loved and those hearts are breaking. RIP little man. My husband and I adopted Mickey Gilley last Saturday. His new name is Scooter. He loves our other dog, Beau and we have fallen in love with him. He is not too sure about the cat but that will take some time. He has already had his vet appt and all went well. He only had to stay in the kennel for two days while I was at work. He now spends the day with Beau. We are so happy we were able to find Scooter. Thanks for all you do. to - such a skinny little boy when he came to us! forever home, thanks to you and the Dachsund Rescue of Houston! From Charlie's new Mom: As I write this email, "Dusty Bottoms" now renamed "Charlie" is laying right by my side! He is so sweet and has bonded with all of us. We are so happy with him! We adopted Scooby back in April of this year. He is such a sweet and loving boy. We feel so lucky to have this handsome guy as part of our family. The first day we brought him home for a sleep over he tried to eat our Pit Bull mix (Timon). Needless to say, we were a little concerned about how this was going to work out. I mean, there's almost a 50 pound difference between these two boys. But, we immediately fell in love with Scooby and knew we wanted to make him part of our family. Over the next couple of weeks the most wonderful thing happened, Timon and Scooby became best friends! Thank you Dachshund Rescue of Houston for helping us find our perfect baby and Timon a best bud (we never thought a dachshund and a pit would be buddies). Ha! I may have missed out on the fabulous party, but I beat out all the other pups there! I was adopted ON THE WAY to Spring Fling! How's that for being the luckiest pup of the day?! Mom moved to the country and doesn't have to restrict the number of pets by "subdivision rules", so I get to say I'm officially home. I'm an honest lady now and don't have to duck the rules by saying I'm a foster. I can still call myself the DRoH Bad Girl, but mom helps me keep that in check. Ya gotta love country livin'! Princess Tabitha, now known as Diva, is a real daddy's girl. Her days are spent ruling the household from dad's lap. To her, there is no better snuggle place in the world! This little man rules the house. 'nough said! I am in love! Maggie is adjusting so well to her new name and surroundings. My desire to have a sweet companion to love has indeed come true. I think she is happy, too. After only a week, we seem to be totally in sync. She has accommodated mid-rise living including elevators very well. Thank you to an excellent foster mom for preparing for and supporting this forever match! Hilde is wonderful, loving and gets along well with Pepe (our other rescue chihuahua mix). She does like to bark, however, but it is usually limited to people walking by the fence and other dogs. You have been instrumental in uniting our family with our gorgeous Dachshund baby :D. My 4 yr. old renamed Nellie, Weenie Girl and she is doing very well. Of course adjusting to her foster mom's departure was tough for that first night (kept wanting to go where "mom" sat) but we have gotten past that. We are sleeping great, no accidents, good eating... very good appetite!, and getting along with kids just great. She Lovessss her Dad and Mom!! Moreover, we are going for walks at least twice daily, have bathed, played fetch until everyone's arm hurt, napped contently, and have been a happy girl. Duncan is such a sweet boy!!! He and Winnie play and run - when they are not digging to China or chasing squirrels. It is hard to believe how fast they are. Between them they chased and cornered a squirrel a few weeks back - never thought they would catch one. We have been very happy with Duncan's progress toward being completely house-broken (even when it rains outside). The "greeting" issue has also diminished greatly and he only "happy piddles" for strangers, anymore. Duncan quickly accepted Grandma - whom he loves. Sherlock is doing really well and is such a sweet love bug! Now that he's three months past his final heart worm treatment, we are letting him play hard. He loves his forever home just as much as we love being his forever parents. We are so grateful to Susan and DRoH for rescuing him from the streets. Victor is settling in so well! We just love him to pieces. He is so gentle and gives the sweetest kisses! He definitely favors women over men but isn't aggressive in the least and is starting to warm up to my husband a lot. He still doesn't quite know what to think of our son but seems to be a lot less fearful of him than he was just 24 hours ago! I even took him for a walk today around the block on a leash and he did really well. He was a little unsure of the cars but really enjoyed sniffing all of the light poles. He hasn't had a single accident in our house and slept well all night in his crate last night. I will say he is totally freaked out by our cat. He really wants to chase her and just barks up a storm and squeals when he sees her. This is definitely going to take some training on our part! The poor cat hasn't come out of hiding since he arrived. Yikes! He gets along great with our Beagle. They hit it off right away! Cooper is a welcome delight to our family. He has adjusted so well. He is a well behaved dog and has fit right into our routine without a problem. He's enjoying his forever family as much as we are him. Sit on the couch and he will curl up in your lap. If I'm busy his favorite place is up on the back of the couch. So cute to see and I take lots of pictures. He loves to be outside and with the sun finally showing it's face he will just sit out and soak it up for ever.We love him! A big thanks to those that rescued him and for his Foster parents for giving him love and attention until he found us.